James Bond 007: The Duel - Cheats - SMS Power! 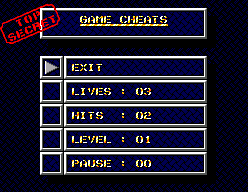 At the title screen, after you press and the screen goes dark, hold + + on controller two until the cheat screen appears. Note that this does not work with the Brazilian version of the game.